Due to a delay in Phase 2 Metro project has increased the cost of land acquisition from Rs 2,000 crore in 2012 to about Rs 6,300 crore in 2019. Banglore, Metro Rail News: The much-delayed 72 km long Phase 2 project of the Namma Metro is finally on track. 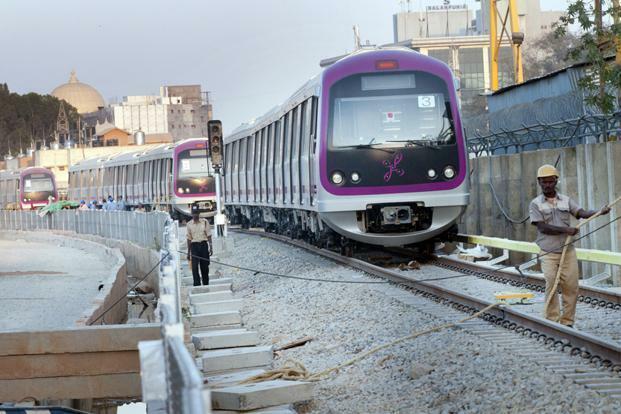 The Bangalore Metro Rail Corporation (BMRCL) officials said that they have acquired land to construct three stations and a depot on the east-west corridor between Baiyappanahalli and Whitefield of 44.45 acres (18.11 hectares) of forest land. Although the land acquisition for the proposed depot at Whitefield (44.8 acres) on the Byappanahalli-Whitefield line will be taking two months as the clearance from the Union ministry of environment, forest and climate change is the only thing Namma Metro is waiting for. The ministry of environment, forests and climate change (MoEF) last week approved in principle the diversion of forest land for a period of 20 years, subject to the fulfillment of 13 conditions. In exchange, the ministry will receive 11.87 hectares (about 30 acres) of land in six villages of Kali Tiger Reserve forest and another 6.56 hectares (16.21 acres) of non-forest land in Thippagondanahalli village. Where as BMRCL had to acquire 30 acres of land from private individuals, the 16.21 acres belongs to the revenue department. Among the 13 conditions. According to source the BMRCL is directed to bear the cost of compensatory afforestation, which will be taken up in both the non-forest lands given to the forest department. The legal status of forest land, the letter says, shall remain unchanged. After the acquisition, the BMRCL has taken possession of about 98.3% of the land it requires for the 19-km Metro corridor and 13 stations on the eastern extension of the eastwest corridor of phase II (Reach 1). It’s yet to acquire some portion of Railway land along Old Madras Road near Baiyappanahalli Metro station. Channappa Goudar, general manager (land acquisition) at BMRCL said. “We had requested the forest department for the land about two years ago, but the process got delayed due to multiple reasons. The acquisition will help us construct three Metro stations and a depot,” he added. “We are providing one acre of land to the police department as it, too, has Vidyalaya and Whitefield — will come upon some portions of the land. Recently, the BMRCLissued tenders for the construction of Metro rail depot at Kadugodi, which is expected to be complete in 2-3 years. The BMRCL had awarded the contract for building 14-km elevated Metro corridor and 13 stations on the Baiyappanahalli-Whitefield stretch in April 2017. While most of the land for the project had been acquired, acquisition of forest land had become a hurdle for the construction work. Of the 80 acres identified for acquisition on the 14-km stretch, almost half of it was forest land. Construction major ITD Cementation has been tasked with the construction of the corridor on the busy stretch connecting central parts of Bengaluru to the IT corridor. The civil wor is expected to be completed in 2-3 years. They are, however, not happy with the progress, which has slowed down after a good start said BMRCL official.